All too often women do not weight train because they fear that they will “bulk up”, the reality is that most women do not have the genetic make up to build large-bulky muscles. Body builders spend hours each week doing a resistance training program designed to increase muscle mass. In reality, most weight training programs will just make the muscles appear more toned and improve body composition. 1. Work all major muscle groups to prevent strength imbalances and injuries (i.e. back, chest, biceps, triceps, abdominals, hamstrings, quadriceps). 2. Beginners should start with one set of 8-10 reps and build up to 3 sets of 8-10 reps. At the end of each set, your muscles should feel fatigued. If an exercise starts to feel too easy, try doing 12 repetitions. 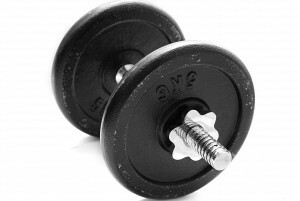 When you can do 12 reps comfortably, you should increase your weight by 5%. 3. Aim to work each muscle 2-3 times per week, allowing 24-48 hours of rest between workouts. This gives your muscles time to recover and provides faster improvements that a daily strength training routine. 4. Be patient. It takes time to see improvements in your body, so don’t expect to see a difference after 1 or 2 workouts. However, you will quickly notice improvements in strength, so focus on that and know that the improved body composition will follow! 5. Include variety. By including a combination of free weights and machines, you will be able to take advantage of the unique benefits that each one has to offer. Varying your routine will also help to prevent boredom and improve overall strength gains. 6. Warming up for 5 minutes prior to strength training helps to improve circulation and cooling down helps to decrease blood flow. Both of these will help to reduce the risk of injury. 7. Don’t forget to stretch after strength training to decrease soreness and maintain flexibility. 8. Remember to consult with your doctor before starting any exercise program. When first starting a weight training routine, it can be helpful to work with a personal trainer. A trainer can help you develop a balanced routine and can teach you the proper form for each exercise. Many gyms offer one free personal training session along with your membership, and some even offer a free session once a year. Take advantage of these sessions so you can get the most out of your workout routine. If you don’t belong to a gym, weight training can be done in your own home with minimal equipment. Resistance bands or a few free weights are often all you need to get a full body workout. Some personal trainers will even go into your home and develop a routine for you using the equipment that you already own. Now that you learned about the three key components of a balanced exercise routine, it is a good time to take a look at your workout routine to make sure it contains aerobic exercise, strength training and stretching. This combination will help maximize the benefits you get from your workouts!